I didn’t think about being thin because I just always was. In fact, I had been so skinny that in the three years I was starring in the fabulous Moulin Rouge extravaganza at the Las Vegas Hilton I wore shorts under my gowns to look fatter! Imagine. Such a problem! But at around age 35, things started to change. I was exercising constantly while learning new dance numbers and doing strenuous production numbers for my show. But instead of slimming down I was getting a little thick around the middle (not fat, but thick). And my moods changed ... things that normally wouldn’t bother me would make me flare up angrily, especially right before my period. This was completely out of character. I would feel murderous if anyone dared to suggest that I had PMS. I knew girls whose mothers had been sent away. No one was shocked or outraged, no one questioned it; it was considered sad but “for their own good.” Imagine! I, being clueless, just figured that in midlife some women went crazy. In fact, they did in a way, but at that time no one understood what was happening, least of all the medical community. Mood swings, PMS, plus annoying weight gain are part of a language that I could not then understand. I didn’t know that these symptoms were simply a prelude to other changes I was about to experience. I didn’t know the misery that was coming. No One Warned Me I Was About to Lose “Me”! My life was good. I was grateful. My TV success had been so unexpected and glorious. I had everything to be happy about. A wonderful husband, a wonderful son, and finally as a family we were working through the barriers of misunderstandings that had been plaguing ours, like so many others at that time who were trying to blend together children who didn’t want new parents or a new “family.” It was new and uncharted territory. Blending our family was a lot of work. I have to say there were many nights I would lie in the dark wondering if it was all worth￼￼￼ !it. I have to say also that, in retrospect, during the time we were blending our family, not only were my hormones changing but they were also colliding with my teenage stepdaughter’s hormones. She was 16 and the combination of the two of us going through severe hormonal changes was awful. Looking back, I feel terrible I had so little understanding of what was happening to both of us at that time. Had I known anything about it I would have been able to help her and help myself at the same time. Ironically every story line we did on Three’s Company was about a misunderstanding, and at home misunderstandings were our running theme. Not easy. I had had a rocky start in life, an abusive alcoholic father, exacerbated by nights filled with fear. By contrast, my adult life was wonderful and beyond my wildest expectations. Professionally, I was enjoying tremendous success, and personally, I luxuriated in a love affair with my husband that I had never known was possible. Putting our two families together was the difficult part; feelings were fragile all around, but years of hard work was paying off. We were making it ... then cameperimenopause! By nature, I’m a happy, upbeat person. I love life and even in the worst of times I tend to look at all situations as a “glass half full.” But now it was beginning to become harder and harder to feel happy or upbeat or loving or funny. I was white-knuckling through every day. I didn’t want their drugs! There had to be another way. I didn’t know what, but I had to find some answer because I was falling apart! It got worse, I found myself “pissed off” most the time. What happened to me? Where was “I”? Where had “I” gone? I found myself crying (a lot), I was unhappy, and now I was getting fat. I had the fun experience of having the National Enquirer print candid pictures of me saying, “Her suit looks snug.” That’s what I needed, feeling like crap every day and now I had the tabloids commenting on every new fat little inch on my once perfect body. I would look at old Three’s Company reruns and all I could see was how thin I was. Instead of laughing and enjoying the fun of the show, I was fixated by my adorable teeny little waistline. I felt like the good times in my life were over. I felt miserable. And I took it out on my incredible husband. It’s hard to be Mrs. Wonderful when you haven’t slept for three years. My eyes looked tired and worn out, with dark circles underneath them from adrenal burnout. At that time I had no idea how important the adrenals were to health and well-being. To compensate, I’d pile on more concealer. Oh my God! Now I was pushing away the best thing in my life: my pal, my lover, my best friend, my business partner, my husband. I knew I had to get a grip. I went from doctor to doctor looking for someone, anyone, who knew the answer to this premenopausal nightmare. I was stunned by the ignorance. No one, not one doctor had a clue how to help me that didn’t include drugs. I was offered synthetic hormones. “But these give you cancer!” I said. Then I heard about an endocrinologist in Santa Barbara (from my manicurist, bless her) who was giving women something called bioidentical hormones. I did my blood work in advance, and on the day of my appointment I drove up the Pacific Coast Highway at full speed to maybe find relief. The doctor said to me, “You poor thing.”“What?” I asked, almost in tears. “I do!” I wailed pathetically. What I didn’t and couldn’t know right then was that this was the moment when my life was going to turn around. That was fifteen years ago. Just know this; the way you’ve been feeling (and acting) is not your fault. Hormones are in control of us physically and emotionally. PMS? It feels real, right? It is. Your chemicals are messed up and we are our chemicals! It’s Not You. It’s Your Hormones! What I’m saying right now is very important; what we do when we have these outbursts is damaging. It’s not your fault—you have not been educated in body chemistry—but nonetheless, these flare-ups wound and hurt the ones you love. When you find it in your heart (and pride), apologize! Explain to your loved one(s) how out of control you’ve been feeling. Promise that you are now on a path to wellness and that it’s all going to be okay again. I cannot stress the importance and healing of this simple first step. We women begin to lose optimal levels of our female hormones (estrogen and progesterone) during perimenopause, which can last for ten to twelve years before menopause, when there is an almost sudden drop in all our hormones. That’s why the effect is so, as they say, “in your face.” Men have it a little easier, although the outcome reached is similar. On an emo- tional level, testosterone is what gives men their enthusiasm and confidence. When it drops too low they experience the blues and grumpiness just like we do. At present the orthodox medical community doesn’t accept that there are safe, effective, natural ways to deal with this challenging passage. They deal with the symptoms of this life transition by prescribing various drugs, what I call the Band-Aid approach. But these solutions promote other negative health changes in women and men, and cause many other conditions to worsen as a result. 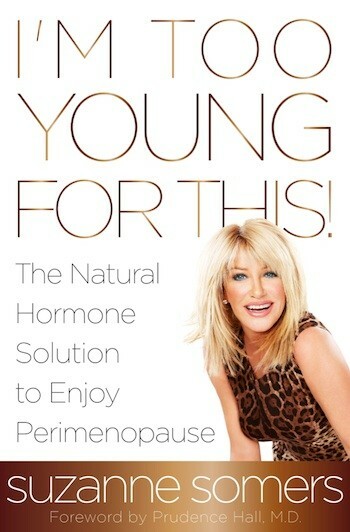 You too can enjoy perimenopause! Yes, I said enjoy and I mean it. The health issues you face are fixable by restoring hormones the natural way. No matter your age or gender, restoring your hormones to their optimal healthy levels has the same effect as giving water to a dying plant. Excerpted from I'm Too Young for This! 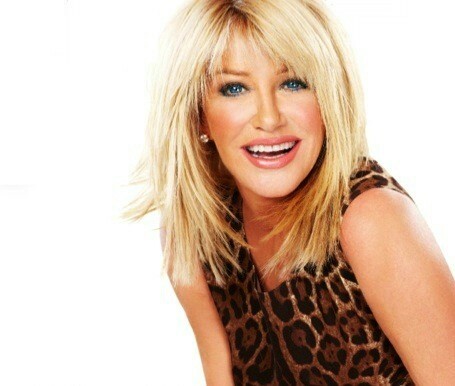 by Suzanne Somers Copyright © 2013 by Suzanne Somers. Excerpted by permission of Harmony, a division of Random House LLC. All rights reserved. No part of this excerpt may be reproduced or reprinted without permission in writing from the publisher.